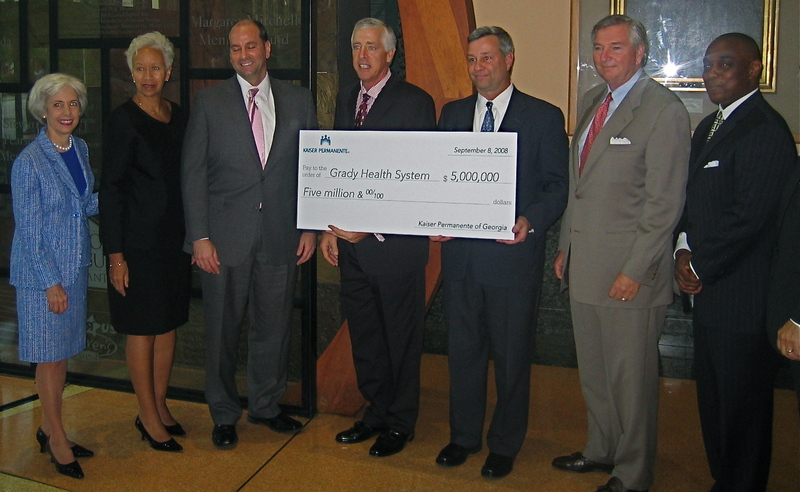 (APN) ATLANTA — The Grady Health System received $5 million from Kaiser Permanente of Georgia on Monday, September 8, 2008, which will go toward the purchase of ambulances, trauma equipment, and the treatment of uninsured patients. The gift, the largest Kaiser Permanente has ever given in Georgia, is the first of what Grady officials hope is many in their quest to raise $100 million to partly match the $200 million promised by the Woodruff Foundation. Tom Bell, a Grady Memorial Hospital Corporation (GMHC) Board Member who is in charge of the capital campaign, said Monday that many groups are interested in donating to Grady. Monday’s event marks the kick off of the $100 million capital campaign that Bell said will really shift into gear in January 2009. Kaiser Permanente is largest non-profit health plan in the United States and in Georgia, serving about 275,000 members at 15 medical locations in Metro Atlanta. Bell said Kaiser Permanente’s gift should spur other prominent players in the business community to step up. it sets a standard for our campaign going forward,” he said. The $5 million gift breaks down into three parts. First, $3 million will go toward the treatment of low-income, uninsured patients who are chronically ill.
Grady’s historic mission to serve the indigent is contributing to an annual loss of millions of dollars because the hospital is not reimbursed in full for these costs. Kaiser Permanente’s gift will allow 1,000 uninsured patients to be treated for one year. Grady officials are staking the hospital’s financial turnaround in part to attracting more paying patients who might offset the costs of treating the uninsured. Second, $1.5 million will go toward the purchase of 10 environmentally friendly ambulances. Grady’s Emergency Management Service (EMS) is the largest hospital-based service in the United States, responding to nearly 95,000 calls per year in a 142-square mile area. The hospital has struggled to repair its aging 35-ambulance fleet with many of the vehicles exceeding 250,000 miles. The EMS lost of all supplemental funding ($6.7 million) for its EMS system from Fulton County on July 1, resulting in a loss of one-third of its total EMS budget. The addition of 10 fuel-efficient ambulances will replace the worst of the fleet. As far as the supplemental funding loss goes, Grady CEO Michael Young said Monday that Grady is prepared, for now, to absorb the costs in order to maintain the same level of ambulance service. The remaining $500,000 will be used to purchase equipment for Grady Memorial Hospital’s Level I trauma center, the only one of its kind in north Georgia. This includes a high-tech portable ultrasound unit, two fiber optic scopes, burn equipment, a transcranial Doppler device, cardiac output monitors, and more. The hospital has struggled for years with woefully outdated equipment, which led to longer wait times for patients and a decrease in quality of care. Young said modern equipment would improve quality, decrease wait times, and allow Grady to serve more patients. New beds are already on the way thanks to Woodruff’s first $50 million installment earlier this year and other equipment such as CT scanners and nuclear cameras have already been identified for replacement. Kaiser Permanente interim president Peter Andruszkiewicz said Woodruff’s pledge greatly inspired his organization to give to Grady. Bell said community support and financial gifts will transform Grady into the standard for other Georgia hospitals. Young said he hoped greater support from the business community would lead to increased, annual funding from the Georgia General Assembly.